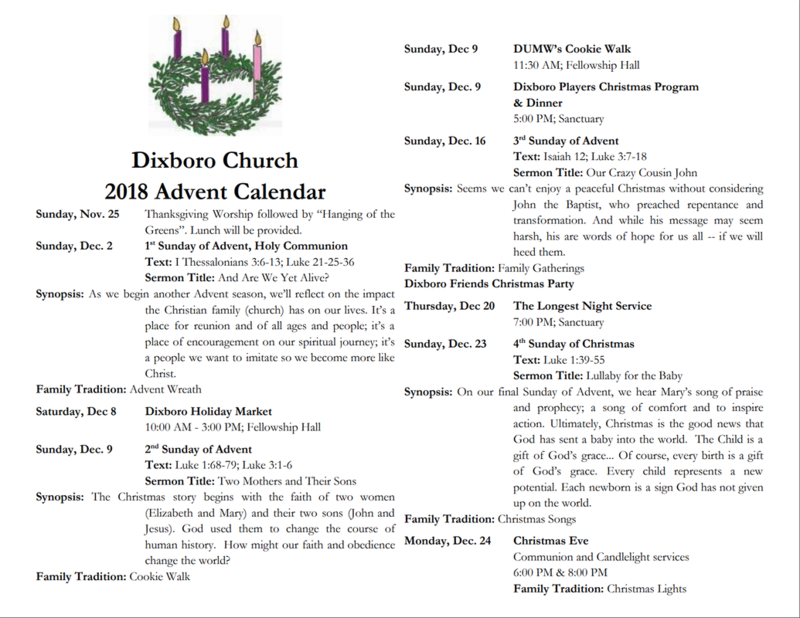 November 20 - Dixboro UMC is planning an outreach opportunity during the Thanksgiving Farmer's Market on Tuesday, Nov. 20th from 3:00 p.m. - 7 p.m. in Fellowship Hall. We will be open for market vendors and shoppers; guests will receive complimentary coffee and hot cocoa. We'll also be assembling 12 Turkey Dinner Baskets going to needy families in our community, identified for us by the Salvation Army. DUMC will provide the turkeys, and our shoppers and vendors will be encouraged to donate produce or baked goods from the Farmer's Market. How Can You Help With Thanksgiving Outreach? Donate food items for a Thanksgiving dinner such as stuffing mix, canned corn, canned green beans, mashed potatoes, gravy, sweet potatoes, etc. Sign up in Fellowship Hall. Deliver Turkey Dinner Baskets to the Salvation Army, Staples Family Center 3660 Packard, Ann Arbor after the market closes at 7:00 p.m. on Tuesday, November 20th. We will gather after worship for lunch and fellowship. Followed by 20-30 minutes of decorating trees and rooms in the church, I will assign you an area. At 12:15 pm we will gather in the sanctuary to sing Christmas carols. December 16 - Christmas Party in Fellowship Hall: Choose a special gift homemade or bought for your Dixboro Friend. We will be collecting new and unwrapped toys for infants through 21 years of age starting November 25. Our last day to collect these items will be Sunday, December 9. As you are looking through toy catalogs and making Christmas lists, think of gifts you can give to someone else in need. All of these toys will go to the Ronald McDonald Holiday Toy Shop. Time to dig through your recipe books and consider what favorite holiday cookie recipe/s you would like to contribute this year. We are so blessed to have such great cooks in our congregation, the Walk is always a great success, and we look forward to another one this year. This year we are trying something different. In place of the tedious process of weighing boxes, we are simply asking for donations/box. 1. To raise funds for DUMW mission work. 2. To allow all DUMC members to have a greater variety of Christmas cookies for family and friends. 3. To provide plates of the unbought cookies to be delivered to folks who can’t make it to services on Sunday mornings. What should I bring? Three to four dozen holiday cookies or holiday treats to the church kitchen by 9:00 am Sunday, December 9.
Who can buy cookies? This year, as in the past, it is only open to the congregation. Next year we are considering a broader audience so stay tuned. The Dixboro Players will present a 40-minute play reminding us of why Christmas is important. The play will be at 5:00 pm followed by dinner in the Fellowship Hall. If you wish to participate in the play, please talk to Beth Little or Peggy Moran. Rehearsals will be after worship.